If you have been keeping up with my Instagram stories lately, then you probably know that I am completely OBSESSED with paninis right now. Over the past few months, our family hasn’t had enough spare time to cook big meals. Actually, full disclosure, our schedules the past few months have meant a lot of drive-thru dinners and takeout lunches. A lot more than I care to admit. So, to try to make sure we aren’t completely off the cooking rails over here, I’ve been trying to whip up easy and delicious meals when I can. Enter the panini obsession! ;) Panini sandwiches have totally been one of my go-to meals in all of the recent madness! They’re quick and inexpensive to make, plus, with the right ingredients, they can be beyond delicious. 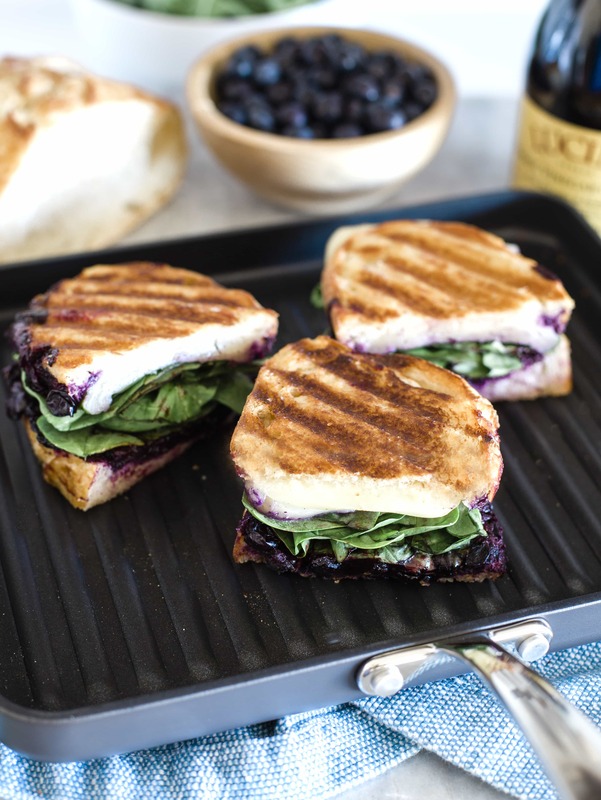 So today I’m sharing some of my panini making secrets with this recipe for a Grilled Balsamic Blueberry and Cheese Panini! To be completely honest, our family’s panini dinner trend didn’t really start with me. It actually started when we decided to buy our Lagostina panini pan. I’ve been using Lagostina for years now, and I’d been hearing a lot of great things about their panini pan. But even after hearing such great feedback, I couldn’t pull the trigger. I thought we didn’t make enough paninis to totally justify buying a whole pan devoted to making them. How funny is that looking back?! I had tried to make paninis before in a skillet, but of course it’s just not really the same. So I finally bit the bullet and bought the panini pan, and now I have no idea how I ever lived without one! The pan makes your sandwiches so crispy and gives them just the perfect bite. And now I seriously can’t. stop. making them. Last week, I made grilled ham and swiss paninis for the whole family and served them with tomato soup for dipping. The kids absolutely loved them! And Andy and I were definitely big fans too! 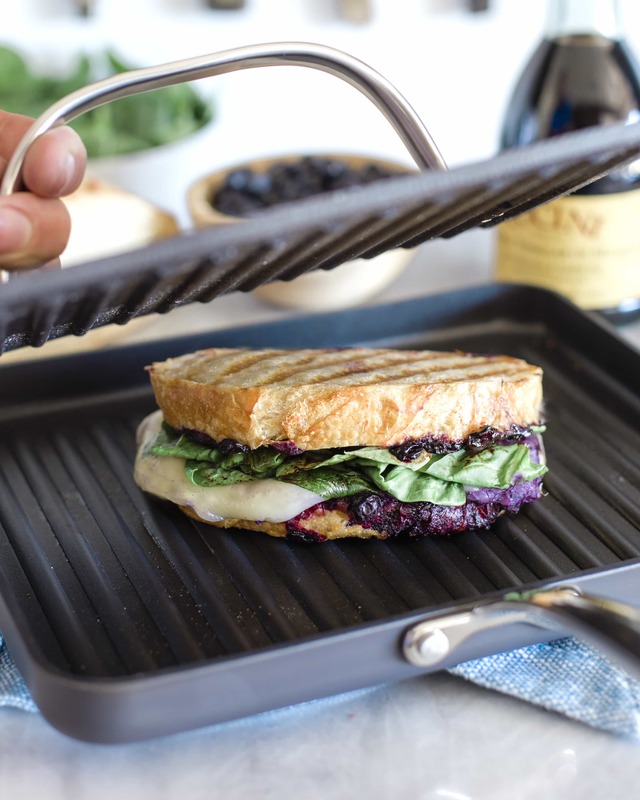 ;) If you love paninis, then I really recommend buying a panini pan for yourself. For this recipe in particular, I promise the pan seriously makes all of the difference. So good! As promised, the recipe for this simple and delicious panini only requires a few minutes and a few ingredients. So easy! For the ingredients, chances are you have half of them sitting in your fridge and pantry already. 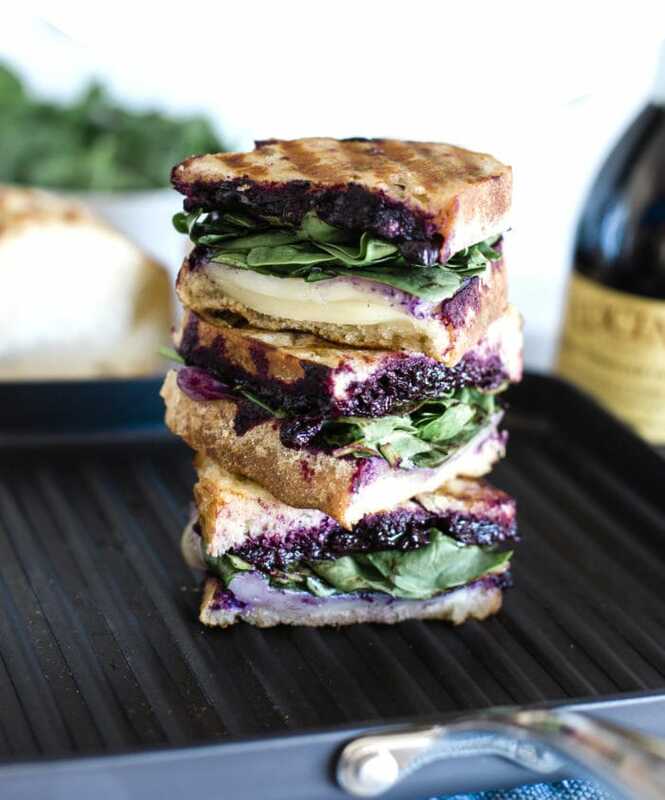 To make one panini, you’ll need two slices of bread, plenty of cheese, a handful of spinach, the other handful filled with blueberries, some balsamic vinegar, and a little bit of brown sugar. See? So simple! To start, you’ll just need to combine your blueberries, sugar, and vinegar in a saucepan and let everything thicken up. Once blueberries and brown sugar are basically all you can smell, you’re ready to start assembling! Take one slice of bread and spread as much of the blueberry mixture onto it as you like. I also like to use a thicker kind of bread like sourdough. I love the way it crisps up and the bread’s sturdiness means it can hold a ton of the blueberries! ;) From here, just top with however much cheese and spinach that you want for your ideal sandwich. I also would really recommend using a white cheese that tends to melt well. After all, you want to get that ooey, gooey, string cheese effect going on right? ;) Any cheese like mozzarella or a nice white cheddar would do the trick. With all of your ingredients in place, now all the work is up to the panini pan! Add a bit of butter into your pan, add the sandwich, and wait for the perfect panini. This Grilled Balsamic Blueberry and Cheese Panini is seriously so good! I know that it may sound like a totally weird combination, but trust me on this one! The salty balsamic vinegar and sweet blueberries are basically a match made in food heaven. Plus, cheese belongs in basically everything right!? ;) Then when you roll the whole thing together and crisp it in a panini pan, you have one of my new favorite sandwiches! This recipe can be made in just a few minutes and is great for an easy lunch or paired with soup for a bigger dinner. Mix blueberries, sugar and vinegar in small saucepan. Cook on medium high until reduced and syrupy. Strain berries from liquid. Butter both sides of your two slices of bread. Spread blueberry mixture onto one piece of bread, top with cheese, and spinach. Grill to perfection and serve!